Incredible. Unbelievable. Extraordinary. Unimaginable… What else can you say about what happened on the night of March 8th, 2017? Did anyone truly expect it? Yes, of course, true Cules wished and hoped but did they actually think it was possible? No, no one did, especially after what happened in the first leg. PSG dismantled the Catalan side 4-0 by attacking the outside backs. It was one of the most efficient onslaughts we’ve witnessed this season. They were able to exploit the space behind Jordi Alba and Sergi Roberto. Luis Enrique’s side had a mountain to climb if they were going to advance to the quarterfinals of Europe’s most prestigious tournament. How did they do it? I will be steering clear of any referee controversy. Football has and will always have controversial matches and we will always disagree. Those arguments are to be discussed on other platforms and in other settings. So I will leave those discussions for friends over a beer. Barça had to come out with everything going forward. Their starting eleven formed a 3-3-1-3 with Messi being a floating midfielder. This is the formation they used in their attacking phase, but as we will see their midfielders (Iniesta, Rakitic, and Messi) were very mobile and attacked PSG’s back line amazingly. Defensively, they played a high risk-high reward game. They set themselves up in a 3-5-2 with Pique as a lone centre back and Umtiti and Mascherano as outside backs, left and right respectively. 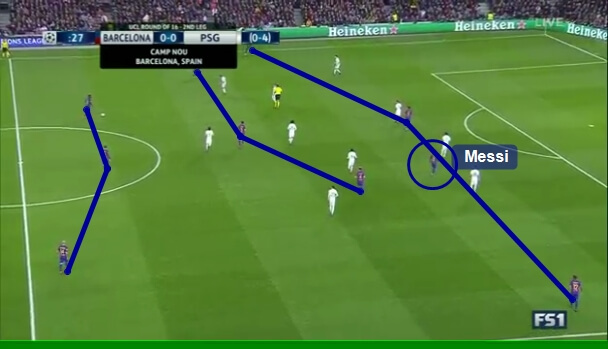 As we can see in the following clip, they pressed PSG very high with Busquets sometimes pressuring their centre backs. This left a big gap in the centre of the pitch which was covered by either Iniesta or Rafinha, depending on the side of the field the ball was on. In dire situations, Pique had to step in to fill the void which left two in the back with a numerical inferiority. This strategy required precise tackles, and in some cases tactical fouls which led to several Yellow Cards. Búsquets’ yellow card means he can’t play in the quarterfinals. Emery decided to put out an almost identical formation as the first leg. Naturally, having a 4-0 advantage from the thrashing in Paris, they started the game sitting back and waiting. When they defended they were set up in a 4-5-1 as pictured below. They created a solid defensive block which moved well in unison despite having given up six goals by the end. In attack, PSG always looked dangerous. They formed a 4-3-3, and considering at times Barça were playing with two in the back, it’s a miracle, amongst other things, that Cavani and company weren’t able to score a second goal. PSG tried to counter with their wingers like they had done so well in Paris but were always met with resistance by the Cule midfield, which seemed to be everywhere. Before we jump into the tactic that Luis Enrique implemented to provide the City of Barcelona this miracle, we must review an important principle of play that made all the difference on Wednesday evening. Football, along with all team sports, is comprised of three main principle of play; possession, progression, and finalization. To score a goal, all three of these principles must be met at some point or another. F.C. Barcelona have been having issues with progression, finding it difficult to effectively move the ball up the pitch. The following clip is an example of how exploiting unused spaced can aid a team in progressing up the pitch even though the second pass is backwards. The Asturian, Luis Enrique, used this principle phenomenally. Using his most effective wing player, Neymar, and his most effective midfielder, Iniesta, he was able to create the perfect conditions for these two to link up and wreak havoc on that left wing. As the following video will show, the plan was simple; Iniesta occupies the space next to PSG’s right back, allowing Neymar the space to work either under or around Iniesta. Time and time again, Iniesta occupied the space looking to play to Neymar. Two of the first three goals came directly from the game plan: the own goal where Neymar played to Iniesta and he managed to somehow make something out of nothing, and the penalty given for the third goal where Iniesta fed the ball into the path of a sprinting Neymar. In the first 60 minutes, it was evident that Barça’s plan was to get the ball to that left wing as much as possible. There were times when they circulated the ball with the intention to try the Neymar and Iniesta combination again. In several instances, like in the following clip, as soon as Rafinha received the ball on the right wing he immediately played it back to circulate back to the left wing. Although a manager may implement a perfect strategy in a match, football is an organic process which is always changing. Therefore, over the course of 90 minutes there are bound to be changes that can affect how a match will play out. PSG’s first goal seemed to be the nail in Barça’s coffin, but as we later found out it simply wasn’t enough. There was, however, a moment that I’m sure Cavani will regret for the rest of his career when he missed a one versus one with Ter Stegen that would have made the score 3-2 and sunk the Catalans for good. Cavani had the perfect opportunity to break 96,000 Barcelonan hearts, if it hadn’t been for Ter Stegen’s left foot. That same foot would go on to finish off the Catalan miracle in the 95th minute. Sergi Roberto’s crucial last minute goal came from a direct kick which had been won thanks to the Barcelona goalkeeper. As we will see, Arda Turan loses the ball following a Messi free kick with Ter Stegen out of the net. The German goalkeeper quickly wins it back only to be fouled immediately after. This was the final free kick. The greatest comeback in European football history, in the historic Les Corts neighborhood in Barcelona, Catalunya, a region so proud of its culture, language, and people. Who else but a homegrown kid? A player who understands what football means for Catalunya, and its capital Barcelona. A young man who embodies ‘Mes Que Un Club’. A midfielder turned right back, unwilling to give up his place on his childhood team year in and year out. Who else than a true fighter who doesn’t know the meaning of ‘give up’? Who else to finalize the greatest resistance to defeat than the Catalan warrior who refuses to take no for an answer? There was no one else. Sergi Roberto.